When 12-year-old Sophie Brown's great-uncle Jim dies, she and her parents move into his run-down farm. Her dad has lost his job and her mom, a journalist, is busy meeting deadlines. Moving from L. A. to a quiet farm is difficult for Sophie who notices the lack of other brown faces, except for her mailman Gregory. She sees a flyer in the barn for The Redwood Farm Supply advertising unusual chickens for the exceptional poultry farmer and begins to write to them for a catalog and advice. She discovers a little hen house on the property and then an angry chicken with apparent super powers shows up. Other unusual chickens arrive one by one and Sophie begins to learn all she can about the care and keeping of chickens. When someone tries to steal her chickens, Sophie finds a way to assert herself and protect her flock. Sophie also endearingly writes letters to her Abuelita (recently deceased), which helps her feel more connected to her Mexican heritage. You will cheer for Sophie as she becomes an exceptional poultry farmer, which begins to help heal the family and also begins to revitalize the farm. The illustrations very funny, adding to this uplifting story. Fans of Katherine Applegate and Erin Entrada Kelly will love this quirky story of a determined girl, and some extraordinary chickens. KATIE KATH earned an MFA from the Savannah College of Art and Design and works as a freelance illustrator. You can learn more about her work at ktkath.com. 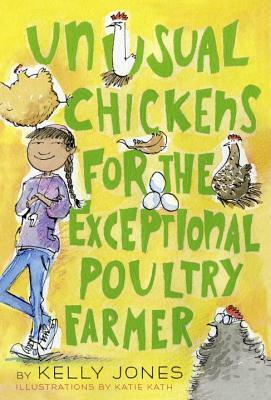 "A delightful protagonist, interesting fowl of various breeds and a cast of appealing second-string characters make this a top pick for young readers, poultry fanciers or not." "Readers will cheer for Sophie and clamor for more of those amazing chickens. Exceptional, indeed." "Someone has finally written a real honest-to-goodness novel with chickens! This news will excite people who like novels, people who like chickens...and chickens. It is an unusual book!" --Daniel Pinkwater, author of The Hoboken Chicken Emergency, and pioneer of chicken-lit.